Algebra is the branch of mathematics concerning the study of the rules of operations and the things which can be constructed from them, including terms, polynomials, equations and algebraic structures. Together with geometry, analysis, topology, combinatorics, and number theory, algebra is one of the main branches of pure mathematics. Elementary algebra is often part of the curriculum in secondary education and introduces the concept of variables representing numbers. Statements based on these variables are manipulated using the rules of operations that apply to numbers, such as addition. This can be done for a variety of reasons, including equation solving. Algebra is much broader than elementary algebra and studies what happens when different rules of operations are used and when operations are devised for things other than numbers. Addition and multiplication can be generalised and their precise definitions lead to structures such as groups, rings and fields. While the word algebra comes from the Arabic language (al-jabr, الجبر literally, restoration), its origins can be traced to ancient Indian mathematics. 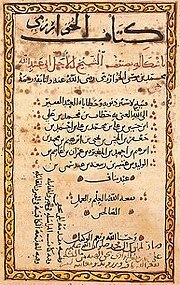 Muhammad ibn Musa al-Khwarizmi learned the technique of Indian mathematics and introduced it to the world through his famous book on arithmetic text, the Kitab al-jam’wal tafriq bi hisab al-Hindi ("Book on Addition and Subtraction after the Method of the Indians"), around 780-850 A.D. The first use of algebraic transformation was descibed by Brahmagupta in his book Brahmasphutasiddhanta, where first proposed solution of Linear Algebra and Quadratic Equation. Algebra is also linked to the ancient Babylonians, who developed an advanced arithmetical system with which they were able to do calculations in an algorithmic fashion. The Babylonians developed formulas to calculate solutions for problems typically solved today by using linear equations, quadratic equations, and indeterminate linear equation. By contrast, most Egyptians of this era Greek and Chinese mathematicians in the first millennium BC, usually solved such equations by geometric methods, such as those described in the Rhind Mathematical Papyrus, Euclid's Elements, and The Nine Chapters on the Mathematical Art. The geometric work of the Greeks, typified in the Elements, provided the framework for generalizing formulae beyond the solution of particular problems into more general systems of stating and solving equations, though this would not be realized until the medieval Muslim mathematicians. The Hellenistic mathematicians Hero of Alexandria and Diophantus as well as Indian mathematicians such as Brahmagupta continued the traditions of Egypt and Babylon, though Diophantus' Arithmetica and Brahmagupta's Brahmasphutasiddhanta are on a higher level. Later, Arab and Muslim mathematicians developed algebraic methods to a much higher degree of sophistication. Although Diophantus and the Babylonians used mostly special ad hoc methods to solve equations, Al-Khowarazmi was the first to solve equations using general methods. He solved the linear indeterminate equations, quadratic equations, second order indeterminate equations and equations with multiple variable. The word "algebra" is named after the Arabic word "al-jabr , الجبر" from the title of the book , meaning The book of Summary Concerning Calculating by Transposition and Reduction, a book written by the Islamic Persian mathematician, (considered the "father of algebra"), in 820. The word Al-Jabr means "reunion".The Hellenistic mathematician Diophantus has traditionally been known as the "father of algebra" but in more recent times there is much debate over whether al-Khwarizmi, who founded the discipline of al-jabr, deserves that title instead. Those who support Diophantus point to the fact that the algebra found in Al-Jabr is slightly more elementary than the algebra found in Arithmetica and that Arithmetica is syncopated while Al-Jabr is fully rhetorical. Those who support Al-Khwarizmi point to the fact that he introduced the methods of "reduction" and "balancing" (the transposition of subtracted terms to the other side of an equation, that is, the cancellation of like terms on opposite sides of the equation) which the term al-jabr originally referred to, "It is not certain just what the terms al-jabr and muqabalah mean, but the usual interpretation is similar to that implied in the translation above. The word al-jabr presumably meant something like "restoration" or "completion" and seems to refer to the transposition of subtracted terms to the other side of an equation; the word muqabalah is said to refer to "reduction" or "balancing" - that is, the cancellation of like terms on opposite sides of the equation." and that he gave an exhaustive explanation of solving quadratic equations, supported by geometric proofs, while treating algebra as an independent discipline in its own right. His algebra was also no longer concerned "with a series of problems to be resolved, but an exposition which starts with primitive terms in which the combinations must give all possible prototypes for equations, which henceforward explicitly constitute the true object of study." He also studied an equation for its own sake and "in a generic manner, insofar as it does not simply emerge in the course of solving a problem, but is specifically called on to define an infinite class of problems." The Persian mathematician Omar Khayyam is credited with identifying the foundations of algebraic geometry and found the general geometric solution of the cubic equation. Another Persian mathematician, Sharaf al-Dīn al-Tūsī, found algebraic and numerical solutions to various cases of cubic equations. He also developed the concept of a function. The Indian mathematicians Mahavira and Bhaskara II, the Persian mathematician Al-Karaji, "Abu'l Wefa was a capable algebraist as well as a trigonometer. [...] His successor al-Karkhi evidently used this translation to become an Arabic disciple of Diophantus - but without Diophantine analysis! [...] In particular, to al-Karkhi is attributed the first numerical solution of equations of the form ax2n + bxn = c (only equations with positive roots were considered)," and the Chinese mathematician Zhu Shijie, solved various cases of cubic, quartic, quintic and higher-order polynomial equations using numerical methods. In 1637 Rene Descartes published La Géométrie, inventing analytic geometry and introducing modern algebraic notation. Another key event in the further development of algebra was the general algebraic solution of the cubic and quartic equations, developed in the mid-16th century. The idea of a determinant was developed by Japanese mathematician Kowa Seki in the 17th century, followed by Gottfried Leibniz ten years later, for the purpose of solving systems of simultaneous linear equations using matrices. Gabriel Cramer also did some work on matrices and determinants in the 18th century. Abstract algebra was developed in the 19th century, initially focusing on what is now called Galois theory, and on constructibility issues. Elementary algebra, in which the properties of operations on the real number system are recorded using symbols as "place holders" to denote constant and variables, and the rules governing mathematical expressions and equations involving these symbols are studied. This is usually taught at school under the title algebra (or intermediate algebra and college algebra in subsequent years). University-level courses in group theory may also be called elementary algebra. Abstract algebra, sometimes also called modern algebra, in which algebraic structures such as groups, rings and field are axiomatically defined and investigated. Universal algebra, in which properties common to all algebraic structures are studied. Algebraic number theory, in which the properties of numbers are studied through algebraic systems. Number theory inspired much of the original abstraction in algebra. Algebraic geometry in its algebraic aspect. Algebraic combinatorics, in which abstract algebraic methods are used to study combinatorial questions. It allows the general formulation of arithmetical laws (such as a + b = b + a for all a and b), and thus is the first step to a systematic exploration of the properties of the real number system. It allows the reference to "unknown" numbers, the formulation of equations and the study of how to solve these (for instance, "Find a number x such that 3x + 1 = 10"). It allows the formulation of function relationships (such as "If you sell x tickets, then your profit will be 3x − 10 dollars, or f(x) = 3x − 10, where f is the function, and x is the number to which the function is applied."). A polynomial is an expression that is constructed from one or more variables and constants, using only the operations of addition, subtraction, and multiplication (where repeated multiplication of the same variable is standardly denoted as exponentiation with a constant non-negative whole number exponent). For example, x2 + 2x − 3 is a polynomial in the single variable x. An important class of problems in algebra is factorization of polynomials, that is, expressing a given polynomial as a product of other polynomials. The example polynomial above can be factored as (x − 1)(x + 3). A related class of problems is finding algebraic expressions for the root of a polynomial in a single variable. Abstract algebra extends the familiar concepts found in elementary algebra and arithmetic of numbers to more general concepts. Sets: Rather than just considering the different types of numbers, abstract algebra deals with the more general concept of sets: a collection of all objects (called elements) selected by property, specific for the set. All collections of the familiar types of numbers are sets. Other examples of sets include the set of all two-by-two matrices, the set of all second-degree polynomials (ax2 + bx + c), the set of all two dimensional vectors in the plane, and the various finite groups such as the cyclic groups which are the group of integers modulo n. Set theory is a branch of logic and not technically a branch of algebra. Binary operations: The notion of addition (+) is abstracted to give a binary operation, ∗ say. The notion of binary operation is meaningless without the set on which the operation is defined. For two elements a and b in a set S, a ∗ b is another element in the set; this condition is called closure. Addition (+), subtraction (-), multiplication (×), and division (÷) can be binary operations when defined on different sets, as is addition and multiplication of matrices, vectors, and polynomials. Identity elements: The numbers zero and one are abstracted to give the notion of an identity element for an operation. Zero is the identity element for addition and one is the identity element for multiplication. For a general binary operator ∗ the identity element e must satisfy a ∗ e = a and e ∗ a = a. This holds for addition as a + 0 = a and 0 + a = a and multiplication a × 1 = a and 1 × a = a. Not all set and operator combinations have an identity element; for example, the positive natural numbers (1, 2, 3, ...) have no identity element for addition. Inverse elements: The negative numbers give rise to the concept of inverse elements. For addition, the inverse of a is −a, and for multiplication the inverse is 1/a. A general inverse element a−1 must satisfy the property that a ∗ a−1 = e and a−1 ∗ a = e.
Associativity: Addition of integers has a property called associativity. That is, the grouping of the numbers to be added does not affect the sum. For example: In general, this becomes (a ∗ b) ∗ c = a ∗ (b ∗ c). This property is shared by most binary operations, but not subtraction or division or octonion multiplication. Commutativity: Addition of integers also has a property called commutativity. That is, the order of the numbers to be added does not affect the sum. For example: 2+3=3+2. In general, this becomes a ∗ b = b ∗ a. Only some binary operations have this property. It holds for the integers with addition and multiplication, but it does not hold for matrix multiplication or quaternion multiplication . An identity element e exists, such that for every member a of S, e ∗ a and a ∗ e are both identical to a. Every element has an inverse: for every member a of S, there exists a member a−1 such that a ∗ a−1 and a−1 ∗ a are both identical to the identity element. The operation is associative: if a, b and c are members of S, then (a ∗ b) ∗ c is identical to a ∗ (b ∗ c). If a group is also commutative—that is, for any two members a and b of S, a ∗ b is identical to b ∗ a—then the group is said to be Abelian. The nonzero rational numbers form a group under multiplication. Here, the identity element is 1, since 1 × a = a × 1 = a for any rational number a. The inverse of a is 1/a, since a × 1/a = 1. The integers under the multiplication operation, however, do not form a group. This is because, in general, the multiplicative inverse of an integer is not an integer. For example, 4 is an integer, but its multiplicative inverse is ¼, which is not an integer. The theory of groups is studied in group theory. A major result in this theory is the classification of finite simple groups, mostly published between about 1955 and 1983, which is thought to classify all of the finite simple groups into roughly 30 basic types. Semigroups, quasigroups, and monoids are structures similar to groups, but more general. They comprise a set and a closed binary operation, but do not necessarily satisfy the other conditions. A semigroup has an associative binary operation, but might not have an identity element. A monoid is a semigroup which does have an identity but might not have an inverse for every element. A quasigroup satisfies a requirement that any element can be turned into any other by a unique pre- or post-operation; however the binary operation might not be associative. All groups are monoids, and all monoids are semigroups. Groups just have one binary operation. To fully explain the behaviour of the different types of numbers, structures with two operators need to be studied. The most important of these are rings, and fields. Distributivity generalised the distributive law for numbers, and specifies the order in which the operators should be applied, (called the precedence). For the integers and and × is said to be distributive over +. A ring has two binary operations (+) and (×), with × distributive over +. Under the first operator (+) it forms an Abelian group. Under the second operator (×) it is associative, but it does not need to have identity, or inverse, so division is not allowed. The additive (+) identity element is written as 0 and the additive inverse of a is written as −a. The integers are an example of a ring. The integers have additional properties which make it an integral domain. A field is a ring with the additional property that all the elements excluding 0 form an Abelian group under ×. The multiplicative (×) identity is written as 1 and the multiplicative inverse of a is written as a−1. The rational numbers, the real numbers and the complex numbers are all examples of fields. Struik, Dirk J. (1987). A Concise History of Mathematics. New York: Dover Publications. Or rather restoration, according to RH Webster's 2nd ed. "The six cases of equations given above exhaust all possibilities for linear and quadratic equations having positive root. So systematic and exhaustive was al-Khwarizmi's exposition that his readers must have had little difficulty in mastering the solutions." Gandz and Saloman (1936), The sources of al-Khwarizmi's algebra, Osiris i, p. 263–277: "In a sense, Khwarizmi is more entitled to be called "the father of algebra" than Diophantus because Khwarizmi is the first to teach algebra in an elementary form and for its own sake, Diophantus is primarily concerned with the theory of numbers". Donald R. Hill, Islamic Science and Engineering (Edinburgh University Press, 1994). Ziauddin Sardar, Jerry Ravetz, and Borin Van Loon, Introducing Mathematics (Totem Books, 1999). George Gheverghese Joseph, The Crest of the Peacock: Non-European Roots of Mathematics (Penguin Books, 2000). John J O'Connor and Edmund F Robertson, MacTutor History of Mathematics archive (University of St Andrews , 2005). 4000 Years of Algebra, lecture by Robin Wilson, at Gresham College , October 17, 2007 (available for MP3 and MP4 download, as well as a text file).